First Lady is operated by the Chicago Architecture Foundation. Their certified volunteer docents are incredible. 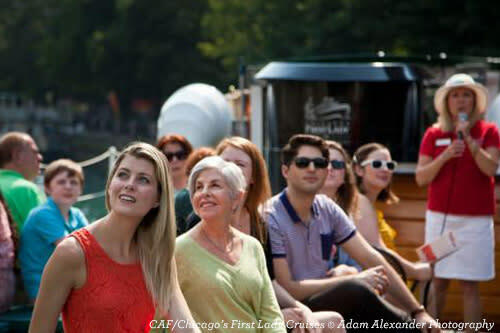 This tour is best for architecture lovers because they go in-depth into the architecture as you slowly cruise past the buildings that line the Chicago River. The cruise is 90 minutes in duration and cruises up and down the river only (it doesn&apos;t go out onto the lake). Bonus: there are bars on most of their boats so if you want to partake in libations during your cruise you can. Tickets are $43.53 for adults and $23.66 for children under 3. The tour departs from the Southwest corner of the Michigan Avenue Bridge (at Wacker). Chicago Line Cruises partners with the Chicago History Museum. Their tours are still focused on architecture, but they weave in more stories and history. They even have a Chicago history cruise if you really want to go in-depth. Chicago Line Cruises are 90 minutes in duration and are on the river only. Their evening cocktails and architecture cruise is a great way to see the city transition from light to dark, and they have an open-bar package available for an additional $21. Bonus: all their cruises include complimentary Starbucks Coffee, Twinings Tea, Coca-Cola soft drinks, lemonade and cookies. Tickets are $43 for adults, $40 for Seniors, $22 for youth age 7–12 and children under 6 are free (tax not included in rates). The tour picks up from the River East Arts Center on McClurg Court. Wendella&apos;s Signature Lake & River tour is 75 minutes long. It&apos;s perfect for families looking for an overview of Chicago&apos;s history and architecture. The pricing is affordable and the cruise is a bit shorter at 75 minutes in duration, making it a bit more appropriate for young children. Plus you get to go out on the lake, which gives the kiddos a little bit of relief and an opportunity to get out of their seats and stretch their legs. This tour has been operating since 1935. Tickets are $35.50 for adults, $32 for seniors over 65, $16.50 for kids 3–11 and under 3 is free. The tour picks up from the Northwest corner of the Michigan Avenue Bridge. The Ultimate Thrill is a 30-minute speedboat boat ride on the lake. The boat is powered by two 1400 HP engines and reaches high speeds of up to 45 MPH. This exciting ride blasts off to start and splashes down to stop, with full 360° spins in between. During the cruise you&apos;ll enjoy twists, turns, music and a fun narration featuring Chicago highlights. Seadog Extreme is the most-horse-powered commercial passenger vessel of its kind currently cruising the Great Lakes. Notes: You must be 48" tall to ride the Seadog Extreme. Children under 12 must be accompanied by an adult. Adults are $31.95. Children 3–12 are $23.95. The cruise departs from Navy Pier. 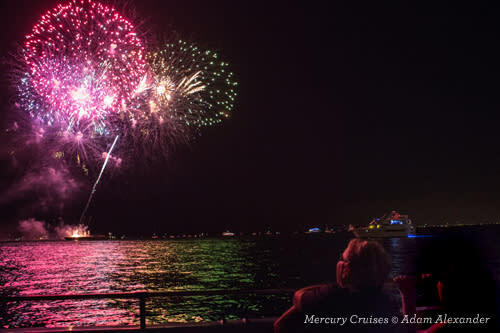 Mercury&apos;s 3D Fireworks Cruise departs Wednesdays and Saturdays, May 27–September 2, 2017 (at 8:30 p.m. on Wednesdays and 9 p.m. on Saturdays). The view of Navy Pier&apos;s fireworks from the water is breathtaking. 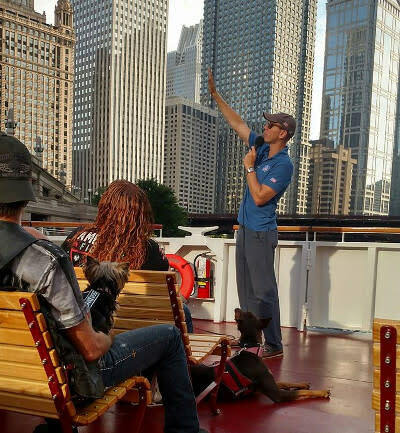 The cruise starts with a pre-fireworks lakefront tour and ends with a view of the fireworks display complete with 3D glasses. Adults are $36. Kids 5–15 are $15. Children under 5 ride free. The tour departs from the Southeast corner of the Michigan Avenue Bridge. Don&apos;t want to leave Fido at home? Leashed pups are welcome on Shoreline Cruises! Shoreline Cruises has two convenient locations, one at the Michigan Avenue Bridge and the other at Polk Bros Park at Navy Pier. Shoreline offers every kind of cruise you can think of: Architecture River Tours, Classic Lake Tours, Fireworks Tours plus Water Taxis. They even have special themed cruises, like Wine Tasting Cruises and Brew Cruises. Shoreline has been family-owned and operated for three generations, currently helmed by brothers Chip and Matt Collopy. Bonus: on Tuesdays and Thursdays at 9:45am Shoreline offers Architecture Tours in Spanish! Adult tickets range from $33 to $44 depending on the cruise. Children 3-12 range from $16 to $21. Children under 3 ride free. Pups ride free as well. Pro Tips: Make your reservations in advance! The boat tours are so popular they often sell out, especially on summer weekends. Book at least a few days ahead to ensure tickets. You can also ask your hotel concierge to assist you with booking for added perks. 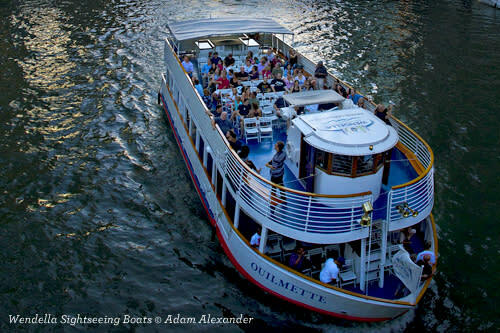 Most boat seating is general admission so be sure to arrive 20 minutes in advance for the best seats. And remember, the boat tours only operate in the warm months (typically April/May–October/November depending on the weather).